Winning several academy awards for its brilliant costumes, Game of Thrones characters have become icons in their own right. The designers for the TV series have used costumes as a story-telling device to portray the emotions of every character and to add depth to the series. From Daenerys to Jon Snow, each character has his or her own preferences and tastes when it comes to apparel and armory. In the beginning, we see Daenerys as a soft-spoken girl who has a penchant for flowing dresses. This soon changes as the character evolves. Her outfits and jewelry are inspired by dragons. Every clan has its own preferences and way of dressing. Each ornament and design represents the culture and history of that clan. This can be proven by the Lannister clan’s consistency for red and gold in their dresses. But during the time of mourning, the characters dress in black. During imprisonment, they are forced to wear beige. All of these changing costumes and shifts in colors are all part of the story, revealing a different side to every character with each season. But that’s not the only significance of costumes in Game of Thrones. Certain armors represent the theme of war and bloodshed. They represent hundreds of years of culture and history. They also set the mood for battle scenes. When going into battle, characters will wear certain type of armory. Even the costumes for the locals were detailed and well-thought out. The designers were careful not to mingle, mix and blend the outfits of the average Joe with leaders of different clans. From blue, to white, to black, every costume is based on specific shades and designs that complement the clans and the characters of the show. These are just some of the many reasons why Game of Thrones is known for its brilliant character designs and costumes. But the kind of costume you design for your character can break or make their image. 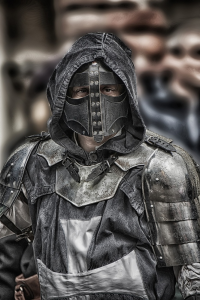 If you want to create your own costumes like Game of Thrones, it’s important to leave it to professionals who can work with your requirements. Prince Armory offers custom-made costume services for film, theater and production! Using premium-quality materials, they ensure that costumes are high-quality and up to the standards of film and production. Visit their website to learn more or browse through their gallery to get a sneak peek of what they offer!